The UAVSAR Flight Planning map is a flight planning tool developed specifically for NASA’s airborne radar called Uninhabited Aerial Vehicle Synthetic Aperture Radar (UAVSAR), but in the future there are plans to make this a general flight planning tool that can be used by anyone. If you log into the site as a guest however you can already play with the tool and experiment with the interface. 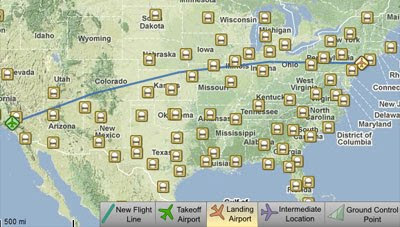 Some of the main features of the interface include drawing flight lines on the map, nudging them, adding them to the current flight plan, and reordering them. You can also add ground control points and search and select takeoff, landing, and intermediate airports. As the flight plan is constructed, all of its components are constantly being saved and the estimated flight times are updated on the fly.